The auto industry is in a big competition when it comes to the auto market and that’s why Renault gets into different partnerships like the one with Dacia and the one with Nissan. Sometimes, a partnership between more than 2 auto manufacturers leads to progress and innovative technology but in today’s case you’ll see a big fail in the SUV crossover niche, where’s the care of cars guys?! Now they made a horrible mistake: Renault let their partners from Nissan to copy their SUV crossover and now the new Nissan Terrano looks like a Dacia Duster! Will the people buy this new Renault Duster replica? What does it has to offer in order to make you buy it? Nissan Terrano’s exterior design vs Renault Duster! Practically the same car!!?? See these car photos with our crossovers? Well there isn’t such big of a difference between their designs, from the side view you can almost say that these two cars are identical. The main differences are that Nissan kept it’s front grill and car emblem or car logo and that these two cars have different headlights and tail lights! 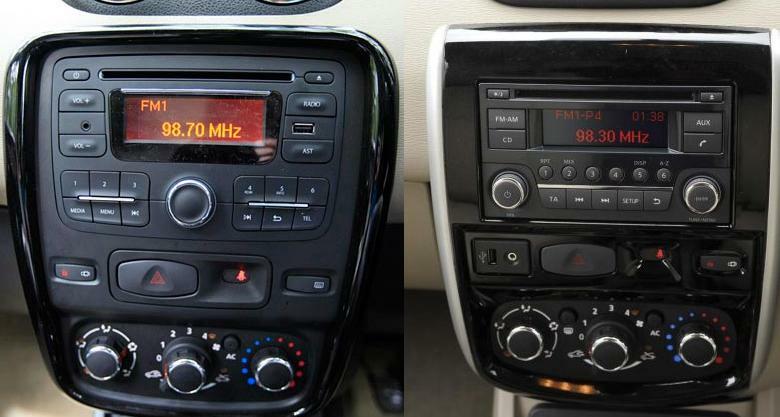 Let’s compare the car interiors of our Nissan Terrano copycat and Dacia Duster! First of all, if you look closely, the climate control layout from the cars is a copy too, the dashboard has the same elements and let’s say that the Nissan Terrano has a more but not that much premium feel :D.
As for the acquisition cost or price tag, you have to know one thing! You will always buy the brand when it comes to the new Nissan Terrano even if it looks the same as the Renault Duster. The Terrano, our Dacia copy, costs more than the Duster and sometimes even if it costs more, you won’t get a lot of options which you see on its twin brother 🙂 so I’m sticking with the Renault.